Chickens are laying eggs that are rolling out of their coops. As the hungry wolf, catch the eggs in your hat. 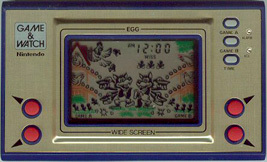 You score 1 point for every egg you catch. If you drop an egg then it breaks and you score a miss, unless the cockerel appears, in which case you will only get a miss if you drop two eggs. If you get three misses then the game ends.